There's no doubt about it: Guerlain Liu Collection for Holiday 2012 is stunning. Black outer packaging, subtle shimmer, rich warm colors tinged with gold-- it's all beautiful. I spent some quality time at the counter but in the end chose only one item: Guerlain Météorites Wulong Pressed Powder compact. It's not that I didn't like the matching Lou-Ling nail polish and lipstick. I did, but I already have enough similar colors. The same goes for the palettes: the eye and lip Calligraphy set (bold red lips, neutral eyes) and Écrin 4 Couleurs Eye Shadow in Turandot. Alll wonderful and definitely have great value as an edited look, but as I was applying the colors from Turandot (fabulous textures) to my eyes I realized I already have similar eye shadows in assorted palettes and singles, and these are not exactly my top go-to shades (though I do find them highly wearable, and in the right combination and ratio quite flattering). In the end the decision was between the two versions of Météorites from this Guerlain collection: Du Dragon' Météorites Perles and the pressed version, Météorites Wulong, in the stunning refillable compact. I chose Météorites Wulong for several reasons: the shimmer of the pressed powder is even more subtle than the pearls-- it's an extremely fine finishing powder with a glow that doesn't look like makeup but has a beautiful light diffusing quality. The husband wasn't able to tell the difference, but I definitely could. Then there's the refillable compact which will see use in years to come (as does its older white sibling Météorites Voyage). 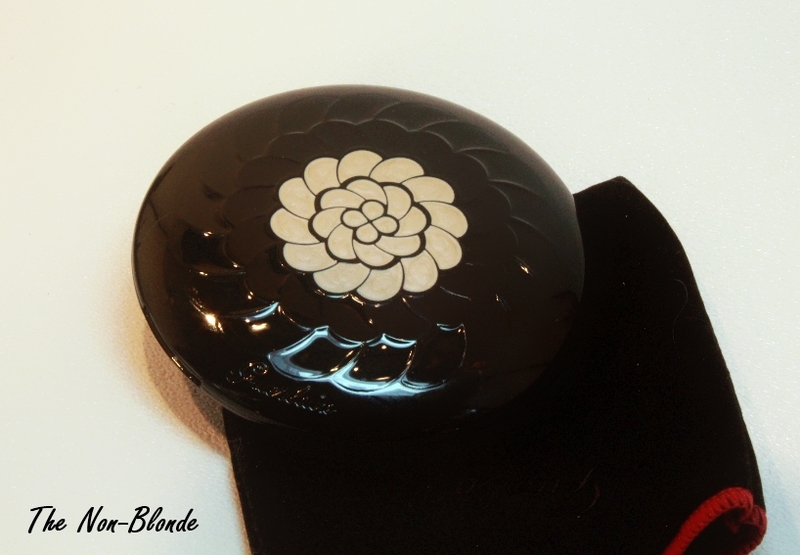 Guerlain's heavy metal compacts are sturdy and travel well (unlike the pearls). Since there's some travel in my near future and I'd like to glam it up, the choice was easy (thankfully, powder compacts don't need to go in the dreadful counter-terrorism ziplock baggy). Guerlain Météorites Wulong Pressed Powder has patches of various pink and gold shades, combined with white. It's still a sheer semi-translucent powder that doesn't add color to my face, but has a warm golden glow that I find very flattering. 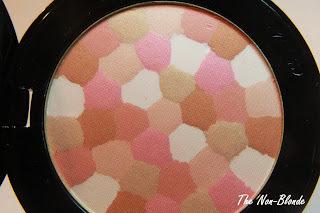 I couldn't get a swatch photo with any kind of normal application (brush or puff)- it's not a highlighter. My friend Charlestongirl from Best Things In Beauty has done the impossible and managed to capture the effect of the Perles du Dragon version on Best Things In Beauty. Have a look, but do remember that the pressed Meteorites have a toned-down version of the glow. 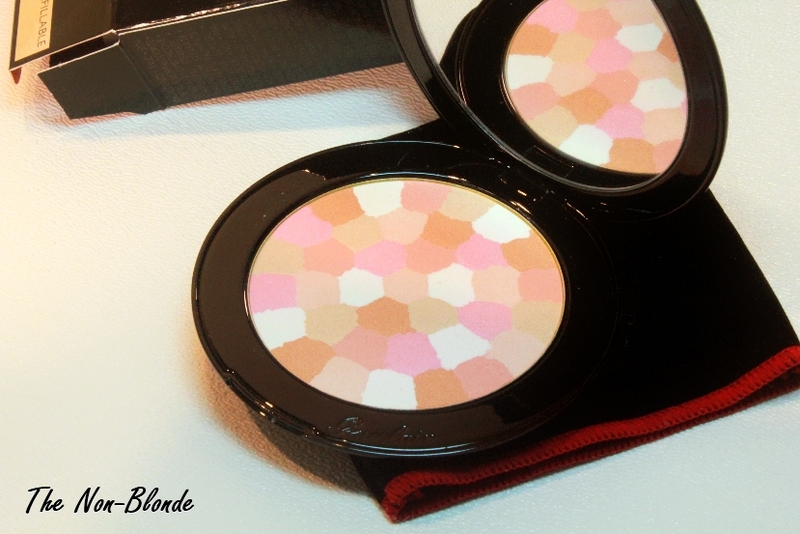 Guerlain Météorites Wulong Pressed Powder ($170) from the Liu Collection Holiday 2012 is a limited edition. Available at Guerlain counters everywhere. Oh... you got it! I've been eyeing this, myself. I need to see the entire collection. I am still using the Pucci meteorites which I love. I may go for the Wulong pressed version for travel. Gaia, you have the answer! I've been looking for this information for a while and I couldn't find it anywhere. 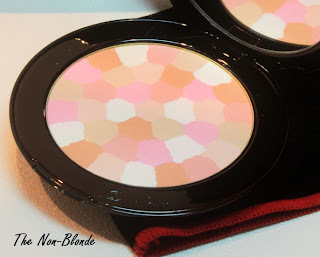 I have to buy online and can't see the product in person, so buying the compact version (voyage) is risky: What if the white parts are glittery, and I can't take them out, of course, because it's a compact? So can you help? Do you know if the shimmery particles in the voyage compact (mythic) are comparable to the ones in 'teint rose 01' (pearls)? Or are they less shimmery, with less visible particles as is this version?